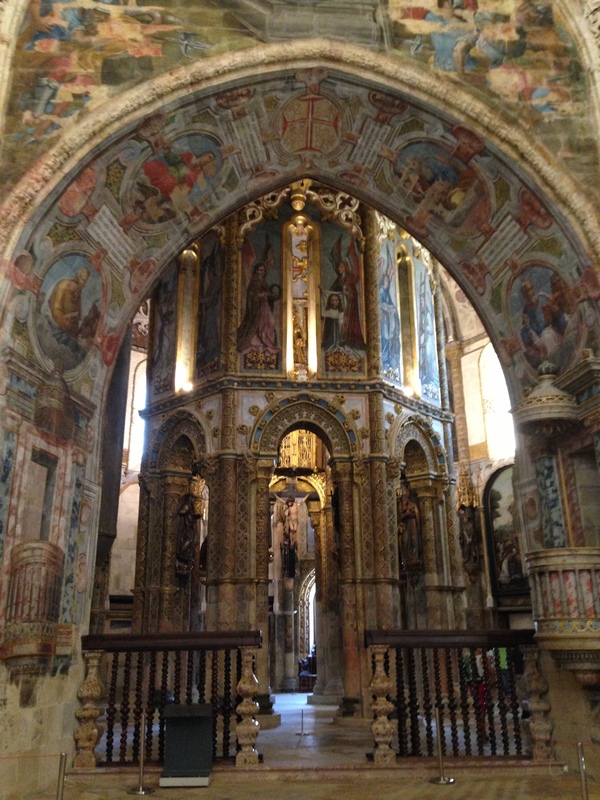 We left Évora (which, by the way, is lovely) and drove north about 2 1/2 hours to Tomar for a day trip to see the Convent of Christ. The monastery was built in the 12th century by the Knights Templar. Its enticing architecture is, like many sites in Portugal, a combination of styles: Gothic, Renaissance, Roman, and, of course, Manueline. It has a church and eight cloisters, and I really enjoyed listening to the audio tour describe the history of the Knights Templar, why the art and architecture is significant, and a glimpse into what life was like for the monks who lived at the Convento de Cristo. By far the most amazing part of the site is the charola/rotunda, and sharing this picture is the honestly driving force behind this post, despite the fact that it could never do the actual rotunda justice. My family went into the monastery with no real expectations, and we all left thoroughly impressed. So far, it’s my favorite thing we’ve done. Overall consensus: the Convent of Christ is definitely worth the trip. Monasteries and Castles and Palaces, Oh My! Spectacular! Another thing to add to my list of places to see. Thanks for sharing! Thanks so much! My iPhone is surprisingly decent in terms of quality. Sure thing! :) Very cool! Great photos. I was just in Portugal but didn’t do any sightseeing. I did many years ago though. Beautiful country.